nice that it didn't have to be landfilled, but I wouldn't ride it. I can say that I know Karl is still riding the bike just fine. This frame was also cracked across one side of the lower bar-fwd where the cables run into the frame. This was repaired some time ago as the frame was bought like that. We do our very experienced best to ensure that repairs are properly considered with regard to the original structural integrity. If we belive that any particular damage/job is not fit for repair then we don't do it! No serious structural damge would ever be repaired with a cosmetic finish only approach to the job. 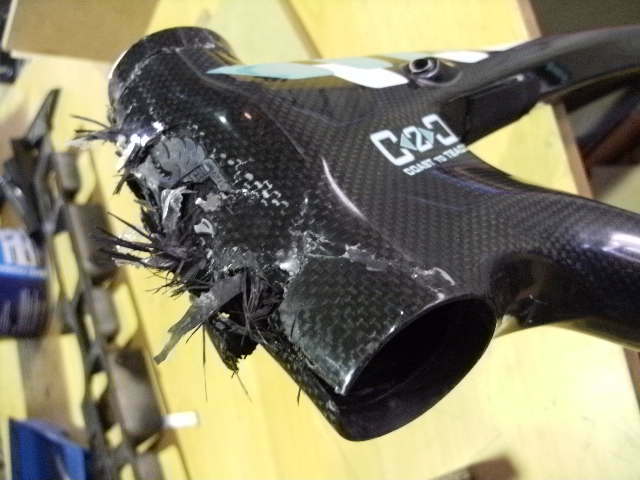 Having said that I can understand the disapointment of many carbon bike buyers when things break, in the past with steel or alloy frames I think i fair to say that bikes just didn't break. Maybe a dent at best? This is the characteristic of epoxy-carbon composites that when pushed beyond it's limits it can simply explode. A professional rider/racer would obviously not chance their race results or body on a bike like this but if the bikes/equipment are respected and used within fair limits then they should be safe as steel. Many bikes have small fractures etc that the rider does not even know are there until their local service shop tells them what they found. All equipment should be cared for shoudn't it? The majority of repairs are quite small and not as destructive as most of those on this blog. They are obviously total write offs so I hope they were all insured. Small damage is typically not so serious but better fixed than ignored as the end result may be much worse. Fabulous work, down to matching the weave and clear coat. Lots of care and craftsmanship are evident. Calfee does repair work around here, again saw a low-overhang car-top bike repaired to new condition. The aviation industry is doing similar work, the advantage being that half the enormous repair cost is inspection methods such as ultrasonic discontinuity testing or x-ray. 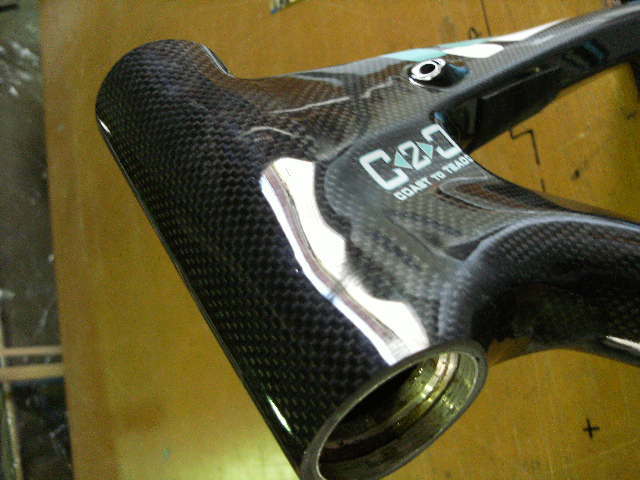 And yes, pros do trust their results to damaged carbon. Ask George Hincapie in the Paris-Robaix. Beautiful repair job... but what's the cost-to-repair versus cost-to-replace ratio? George Hincapie in the Paris-Robaix...that was an alloy steerer that broke.